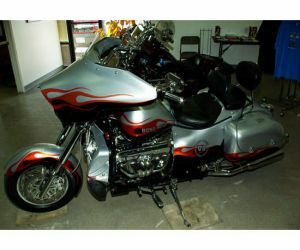 This 2007 BOSS HOSS BHC-3 ZZ4 Bagger is a nice looking bike to be sure! It is in practically mint condition. It weights about half a ton. It has a fuel injected ZZ4 350 CI water cooled engine with a semi automatic two speed transmission. It also has reverse gear. The seat has a driver's back rest and there is a a large seat for a passenger. The passenger seat flips up and has a storage compartment underneath. Both seats are Mustang Seats. This beauty also has rear compartments and Hard Bag saddle bags with carrier in liners. It even has am, fm, and cd stereo! As you can see, the paint job is custom bright silver with black and gold highlights. The exhaust system is custom made. There is color matched chrome mounting, and it has a Touring Drivers Sissy Bar with an extra large pad.